On October 24, 2015, Neil deGrasse Tyson, astrophysicist and 19-year Planetary Society Board Member, received The Planetary Society's Cosmos Award for Outstanding Public Presentation of Science. Tyson, Director of New York City's Hayden Planetarium, hosted "Cosmos: A SpaceTime Odyssey," a television series that paid tribute to Carl Sagan's original "Cosmos" program. "Every day, Neil deGrasse Tyson inspires this and the next generation of explorers," Nye explained. "He encourages us all to use the process of science to ask questions, to seek answers to nature's mysteries, to keep searching, to know the cosmos and our place within it. Neil inspires the students among us today, who will carry on with the search for life on Mars and Europa. They will solve cosmic mysteries that many of us have yet to even imagine. It's an honor to know him." 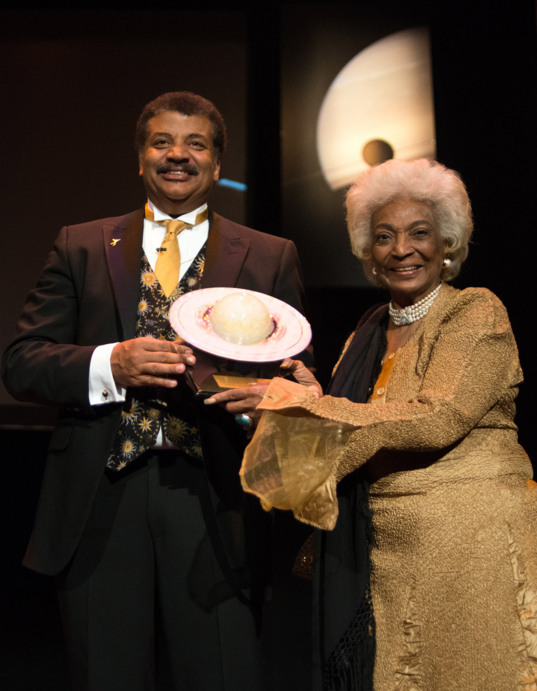 Neil deGrasse Tyson receives the Cosmos Award for Outstanding Public Presentation of Science from Nichelle Nichols at The Planetary Society's 35th anniversary More to Explore event.